Stewarts of America has experience in development, design and innovation of pinned products for many textile applications, including Non-Woven Textiles, DREF Spinning Equipment, Waste Opening, Blow Room, Opening and Carding, Drafting and Combing, Open End, Finishing, Weaving, and Used Textile Machinery and Equipment for textile customers around the world. Stewarts of America has experience in development, design and innovation of pinned products for many textile applications. Solving problems for textile customers around the world is our specialty. Stewarts of America has long been involved in all sectors of the textile industry. 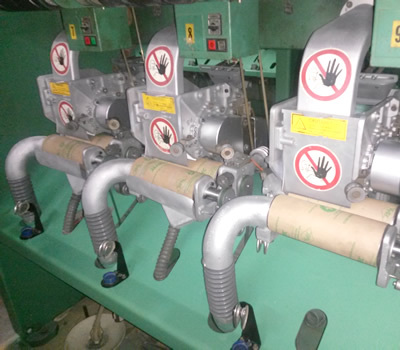 We also have the ability to refurbish and rebuild existing textile machinery. We have worldwide partnerships and representation to be able to assist you, no matter where you are located. 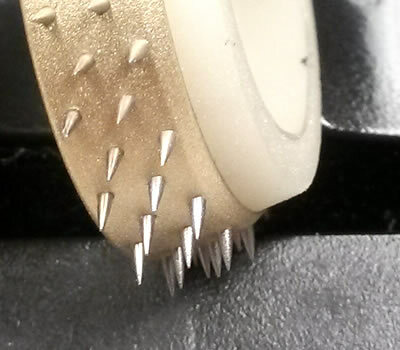 Because of the nature of Stewarts of America's pinning technology, it is often possible for us to remove and replace some or all the pins in your existing pinned product. If your pinned product is damaged or worn, contact us to see if it is worthwhile and/or possible. Stewarts of America manufactures components for Fehrer DREF Friction spinning equipment. Stewarts also offers new and used Fehrer DREF Friction spinning machinery. Recognizing that there was a need by our customers, Stewarts have developed a solid base of spare parts for Fehrer DREF friction spinning equipment and now offer a wide verity of parts to include both mechanical and electrical components. 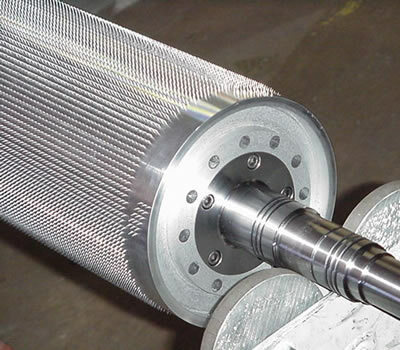 Stewarts of America has modified high wear machine components such as the perforated cylinders, suction tubes and motors to make them work more efficiently, even with tough materials such as fiberglass, Nomex and Kevlar. Working together with our customers worldwide, Stewarts offer a wide array parts and modifications that allow new and unique yarns to be made by this equipment, and to make parts for these machines more accessible. Stewarts can take an existing Fehrer DREF spinning machine, completely tear it down, and build it back completely refurbished. We offer electrical drive conversions, part upgrades and technical expertise. Naturally, we are in touch with mills worldwide and are often the first to know about used equipment that comes available to the marketplace. The difference is we know the technical spinning industry. We are also experts in the mop yarn industry, we offer worldwide support and consultation for this field. Pinned lags - Whether you have a LaRoche, Dell'Orco and Villini, Margasa, Marlasca, Italia Regeneratzione, Temafa, Autefa or other waste opening unit, Stewarts can manufacture pinned lags for your cylinders. We offer standard pin configurations and completely custom configurations for unorthodox applications. Our waste opening pins are designed to penetrate and open fiber effectively but gently, keeping as much staple length as possible. 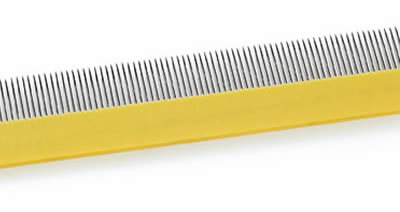 The pins are designed to maximize opening and keep long life, while minimizing friction. 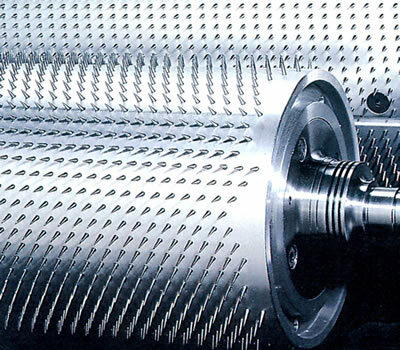 Stewarts of America offers pinned aluminum and wooden lags for all textile recycling machinery. From interlocking tongue and groove lags, to flat lags with scallops, Stewarts has made pinned lags for the textile industry for over 130 years. 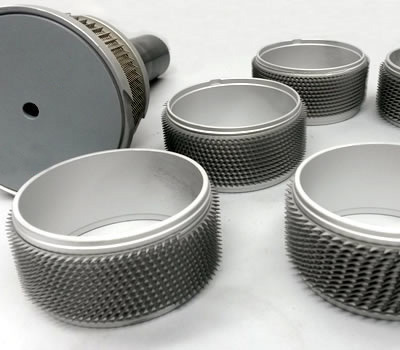 We have the designs for all the OEM lags, and specialize in placing custom pin patterns in cylinders to achieve unique opening capabilities. We have worked with tough to open fibers such as carpet, Kevlar and other materials. We can convert opening machinery that currently does not do the job, to super openers! The Waste opening / textile recycling process is tough on pins. The process can generate lots of heat from friction and sparks from metallic debris that are processed with used clothing and other post-consumer materials. This heat can cause breakdown of the holding capability of the pins in the metallic lag. Solving this problem led Stewarts of America to innovate with our latest technology – The Excalibur™ pins – The pin that will not liberate! Using a clever pin and hole technology combination, we keep the price of the technology low, while utilizing the benefits of a mechanical fit. Stewarts also uses our pin pattern layout technology to optimize the opening effect on fibers. This makes opening more efficient and generates less friction. All our pinned lags are machined on our state of the art CNC machining centers to ensure precise pin hole placement, pattern and tolerances. Bolt holes are machined at the same time, thus providing highly accurate mounting locations to align with customer's existing cylinders. The unique design of interlocking aluminum alloy staves have firmly established themselves in the world's fiber industries with its extended life and strength. Over 5 million being supplied to well over 55 countries over the past 80 years and their accuracy and long life are now legendary. Indeed some of the original staves are still running after many re-pinnings. For high density pinning, our staves have now demonstrated their accuracy and reliability over some 25 years. The interlock between our staves means that the staves in front and behind each stave contribute to the total strength of the assembly, and greatly reduce the chances of a catastrophic damage in a card smash. Edge trim and mini-trim openers come in a wide verity of widths and diameters. Stewarts covers them all. Fewer retaining screws are needed because of the strength of the aluminum alloy together with the patented interlock. This means less gaps in the pinning, improved carding and easier maintenance. In many cases the staves and lags can be made double width, further reducing the problem. However the screw holes are still placed so that the aluminum staves can be fitted in place of wooden staves without modification. Stewarts of America manufactures a wide variety of products for blow room, opening and carding machinery. Stewarts manufactures both pinned lags, pinned and wire rollers for cleaning and opening machinery such as Trutzschler's CVT and Rieter's ERM and Unimix systems, amongst many other OEM machinery. Chances are, if you have one of these machines, you already have our pinned products in your machinery. We have the original specifications and drawings for many of these rollers as we are the manufacturer of choice for many textile machinery makers worldwide. Stewarts is involved in two areas of the carding machinery. Stewarts manufactures pinned cylinders and bars for chute feed applications and pinned and wire licker ins. Pinned licker ins are sometimes used alone against the main carding cylinder, or may be included in a 3-roller cassette, such as in a Trutzschler cards, where the pinned roller takes the brunt of the primary opening work. 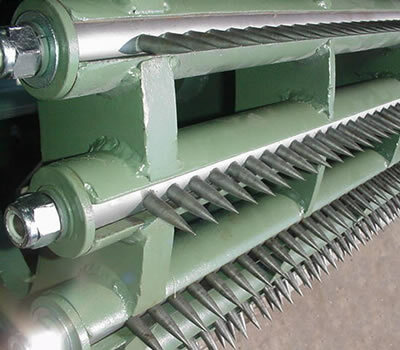 Stewarts supplies a wide range of Spiked Lattices for Feed Hoppers, Conveyors and Bale Openers. Used for transporting, lifting and opening. Stewarts offers standard lattices as per OEM specifications, and custom made lattices if required. 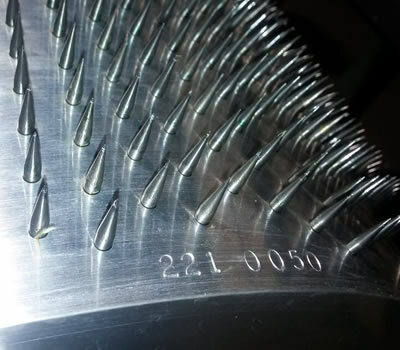 Spiked/Pinned lattices are manufactured with quality carbon steel pins which allow for long production life and high precision. 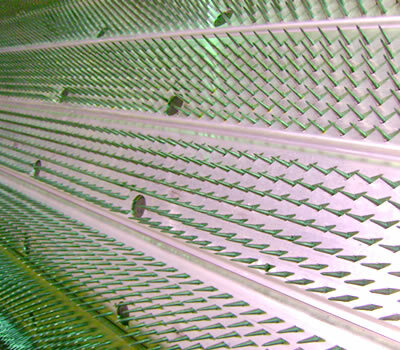 Spiked Lattices can be made to any length to include the extended lengths now required for Non-woven applications. A wide range of pinning specifications are available depending on your application and requirements which can be tailored to suit. Stewarts will work with you to make the pinned products easier to replace, maintain and change out. We can offer help with improving efficiencies and fiber opening effectiveness. Stewarts supplies a full range of Press Fit type Pinstrips with advantages of long long life, excellent fiber opening, quick remounting of fallers and economical prices. 2.5 to 9 PPCM / up to 300 mm pin set over /11 to 25 mm pin height. 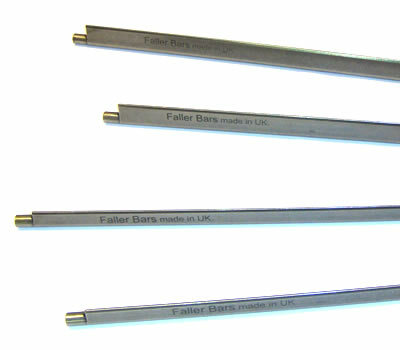 Faller bars available for most leading chain driven machines, both high and low back, with various set overs, pin projections and the option of flat or round-pins. Disposable faller bars for NSC Schlumberger GC and Sant Andrea CSN chain gill boxes. The large diameter steel core is machined on CNC lathes and precision bending tools. The steel core is presented to the injection moulding machine and the colored plastic is molded to the steel core and the keyed pins in one operation. The plastic is color coded for pins per cm. Color coded end rollers are fitted as standard. All fallers are inspected for quality control. Stewarts supplies Steel faller bars for NSC Schlumberger GC and Sant Andrea CSN chain gill boxes. The fallers are suitable for Press Fit Inserts. Stewarts supplies Steel Fallers for NSC GN Screw Gills and Cognetex system gills are also available. The universal drafting head of the Schlumberger GC chain gill requires chains of high quality to allow speeds of up to 400m/min. We supply new chains pitch 9.525mm part ref no 423A152M. Four Chains are required per GC machine. The chains are in stock for immediate delivery. 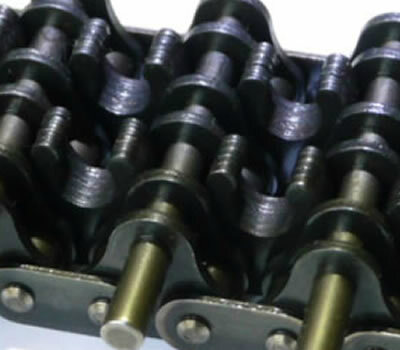 Several thousand chains sold with repeat orders demonstrates our product quality. 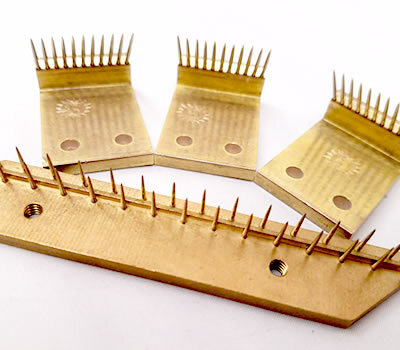 Brass Gills for bast fibers, such as jute, flax, sisal, hemp, etc. Stewarts of America manufactures a number of components for open end spinning machinery. Whether you have a Schlafhorst, Rieter, Savio, Investa, Ingolstatdt or other open end spinning frame. We have many of the OEM technical drawings to make the parts for your requirements. Stewarts manufactures just about any rotor cup you require, any diameter and any groove. All dynamically balanced to OEM specification. Stewarts of America was the first manufacturer of open end spinning parts in America. Now, we are the last. Parts made in the USA. Stewarts manufactures navels and doff tubes to any OEM or custom specifications. Navels can be made in steel or with ceramic inserts. We offer grooved navels and navels with roughing devices if required. 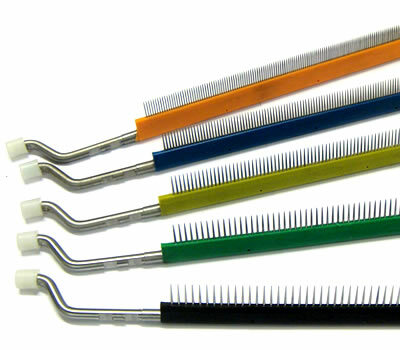 Stewarts manufacture a wide verity of combing rolls and ring. Both pinned and wire. We offer a wide array of wire types. These wires are used with an array of coating. Made to OEM or custom specifications. Stewarts of America supplies pinned tenter/steter plates for most machinery manufacturers such as Kenyon, Monforts, Krantz, Babcock, Winsor & Jerauld, Fabcon, Artos, Harish, Entec, Marshall & Williams, Famatex, Bruckner, Corino, Entec, Fabcon, Tubetex, Hunter, Morrison, Mascoe, Proctor & Schwartz, Gessner, Ewa, Muzzi, Tandematic, Texima, Santex, Singer, Santa Lucia, Tacker, Liba, American Liba and Stentex. Brass pin plates for all leading brands of Stenters with hardened, mirror finished, extra fine tipped pins. 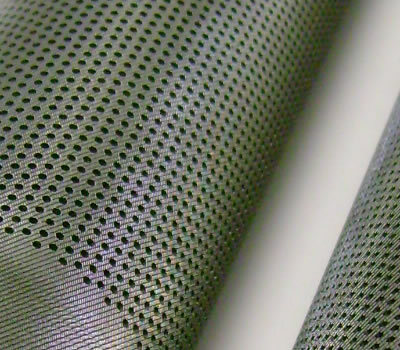 Stewarts can also supply a new unique designed hard poly plate for low cost, light weight, non-corroding, non-marking for light to medium fabrics. Made with thermoplastic material that withstands up to 240°C. These pinned plates can house carbon steel or stainless steel pins with 8 to 72 pins per plate, 0.08 to 2mm diameter of pins, 9.5 to 20mm length of pins. Stewarts of America also manufactures aluminum pin wheels that are utilized in selvedge trimming and fabric guiding. We offer a wide verity of designs and sizes. 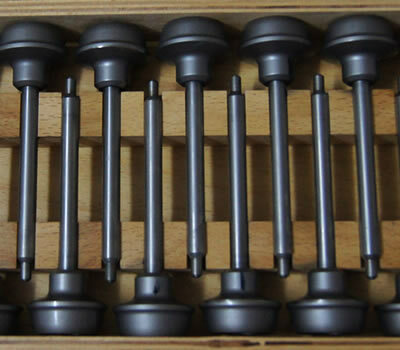 We can provide you with the pin wheels that you need for your specific type of tenter frame or guiding system you utilize. Stewarts of America provides Temples for Weaving Looms for manufacturers including Sulzer, Dornier, Tsudakoma, Toyota, Picanol, Nuouo Pignone, Vamatex, Somet, Saurer and other makes of Shuttleless Looms. Temple cylinders are available in various configurations of rings; spiked, plain or rubber to suit various fabrics and to avoid temple marks. We also design custom solutions for special fabrics. Rubber Rings and Dummy Rings are also available. Brass Rollers in various shapes and sizes, to customer specifications. Pin height 0.25 to 2.00 mm and up to 50 pins per sq. inch. Stewarts of America purchases and sells many different types of used textile equipment for yarn manufacturing, open end spinning, friction spinning, fiber and waste recycling, non-wovens, and other industries. Machinery is sold and brokered directly from our warehouse inventory or straight off the mill floor. Please contact us if you have any specific machinery requirements. As a manufacturer of parts for textile machinery, we have contacts all over the globe, and we are often the first to know about available machinery. The ability to machine and manufacture parts also makes Stewarts unique, as we can manufacture parts to refurbish or modify machinery we find on the used market. We specialize in older, hard to find open end spinning machinery and DREF spinning machinery. Stewarts are experts in worldwide logistics, and move machinery all over the world on a regular, reliable basis. Stewarts is the North American agents for TATHAM, worldwide manufacturer of non woven machinery, and supplier of used textile machinery.